LOCATION.--Lat 41`24'48", long 78`11'50", Cameron County, Hydrologic Unit 02050202, on left bank at downstream side of highway bridge on SR 3002 at village of Sterling Run, and 300 ft upstream from Sterling Run. PERIOD OF RECORD.--October 1913 to current year. GAGE.--Water-stage recorder. 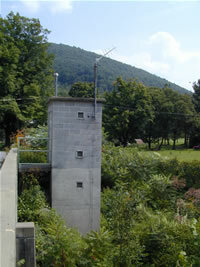 Datum of gage is 894.84 ft above National Geodetic Vertical Datum of 1929. Oct. 1, 1913 to Sept. 30, 1931: non-recording gage; Oct. 1, 1931 to Sept. 30, 1932 and Oct. 1, 1942 to Oct. 3, 1991: water-stage recorder at site 50 feet upstream on steel-truss bridge at same datum. Satellite and landline telemetry at station.